A drink or beverage is a liquid that you can take into your body, by using your mouth. Typical drinks for humans include water, tea, milk, coffee, juice, soft drinks and alcoholic drinks. All drinks are mainly water. All life needs water to live. Plants take in water through their roots, which are found underground. Most animals get water by drinking. To drink means to take a drink into your body. As mankind evolved, new techniques were discovered to create drinks from the plants that were native to their areas. The earliest archaeological evidence of wine production yet found has been at sites in Georgia (c. 6000 BCE) and Iran (c. 5000 BCE). Beer may have been known in Neolithic Europe as far back as 3000 BCE, and was mainly brewed on a domestic scale] The invention of beer (and bread) has been argued to be responsible for humanity's ability to develop technology and build civilization. Tea likely originated in Yunnan, China during the Shang Dynasty (1500 BCE–1046 BCE) as a medicinal drink. Drinking has been a large part of socialising throughout the centuries. In Ancient Greece, a social gathering for the purpose of drinking was known as a symposium, where watered down wine would be drunk. The purpose of these gatherings could be anything from serious discussions to direct indulgence. In Ancient Rome, a similar concept of a convivium took place regularly. 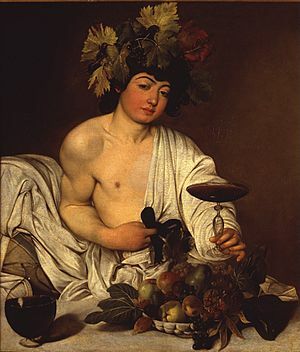 Many early societies considered alcohol a gift from the gods, leading to the creation of gods such as Dionysus. Other religions forbid, discourage, or restrict the drinking of alcoholic drinks for various reasons. In some regions with a dominant religion the production, sale, and consumption of alcoholic drinks is forbidden to everybody, regardless of religion. Toasting is a method of honouring a person or wishing good will by taking a drink. Another tradition is that of the loving cup, at weddings or other celebrations such as sports victories a group will share a drink in a large receptacle, shared by everyone until empty. In East Africa and Yemen, coffee was used in native religious ceremonies. As these ceremonies conflicted with the beliefs of the Christian church, the Ethiopian Church banned the secular consumption of coffee until the reign of Emperor Menelik II. The drink was also banned in Ottoman Turkey during the 17th century for political reasons and was associated with rebellious political activities in Europe. A drink is a form of liquid which has been prepared for human consumption. This can include a number of different steps, some prior to transport, others immediately prior to consumption. Water is the chief constituent in all drinks, and the primary ingredient in most. Water is purified prior to drinking. Methods for purification include filtration and the addition of chemicals, such as chlorination. The importance of purified water is highlighted by the World Health Organisation, who point out 94% of deaths from diarrhea – the third biggest cause of infectious death worldwide at 1.8 million annually – could be prevented by improving the quality of the victim's environment, particularly safe water. Pasteurisation is the process of heating a liquid for a period of time at a specified temperature, then immediately cooling. The process reduces the growth of micro-organisms within the liquid, thereby increasing the time before spoilage. It is primarily used on milk, which prior to pasteurisation is commonly infected with pathogenic bacteria and therefore the more likely than any other part of the common diet in the developed world to cause illness. 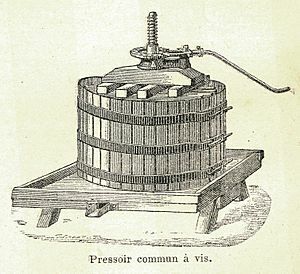 First developed in the Middle Ages, basket presses have a long history of use in winemaking. The process of extracting juice from fruits and vegetables can take a number of forms. Simple crushing of most fruits will provide a significant amount of liquid, though a more intense pressure can be applied to get the maximum amount of juice from the fruit. Both crushing and pressing are processes used in the production of wine. Infusion is the process of extracting flavours from plant material by allowing the material to remain suspended within water. This process is used in the production of teas, herbal teas and can be used to prepare coffee (when using a coffee press). Carbonation is the process of dissolving carbon dioxide into a liquid, such as water. Fermentation is a metabolic process that converts sugar to ethanol. Fermentation has been used by humans for the production of drinks since the Neolithic age. In winemaking, grape juice is combined with yeast in an anaerobic environment to allow the fermentation. The amount of sugar in the wine and the length of time given for fermentation determine the alcohol level and the sweetness of the wine. When brewing beer, there are four primary ingredients – water, grain, yeast and hops. The grain is encouraged to germinate by soaking and drying in heat, a process known as malting. It is then milled before soaking again to create the sugars needed for fermentation. This process is known as mashing. Hops are added for flavouring, then the yeast is added to the mixture (now called wort) to start the fermentation process. Distillation is a method of separating mixtures based on differences in volatility of components in a boiling liquid mixture. It is one of the methods used in the purification of water. 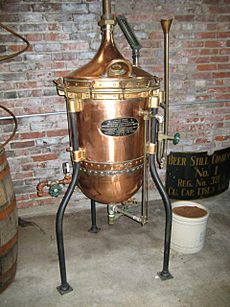 It is also a method of producing spirits from milder alcoholic drinks. An alcoholic mixed drink that contains two or more ingredients is referred to as a cocktail. Cocktails were originally a mixture of spirits, sugar, water, and bitters. The term is now often used for almost any mixed drink that contains alcohol, including mixers, mixed shots, etc. A cocktail today usually contains one or more kinds of spirit and one or more mixers, such as soda or fruit juice. Additional ingredients may be sugar, honey, milk, cream, and various herbs. 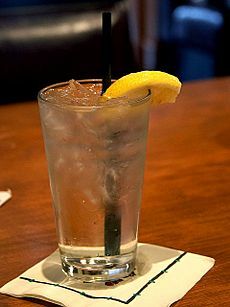 A non-alcoholic drink is one that contains little or no alcohol. This category includes low-alcohol beer, non-alcoholic wine, and apple cider if they contain less than 0.5% alcohol by volume. The term "soft drink" specifies the absence of alcohol in contrast to "hard drink" and "drink". The term "drink" is theoretically neutral, but often is used in a way that suggests alcoholic content. Drinks such as soda pop, sparkling water, iced tea, lemonade, root beer, fruit punch, milk, hot chocolate, tea, coffee, milkshakes, and tap water and energy drinks are all soft drinks. Water is the world's most consumed drink however, 97% of water on Earth is non-drinkable salt water. Fresh water is found in rivers, lakes, wetlands, groundwater, and frozen glaciers. Less than 1% of the Earth's fresh water supplies are accessible through surface water and underground sources which are cost effective to retrieve. In western cultures, water is often drunk cold. In the Chinese culture, it is typically drunk hot. Regarded as one of the "original" drinks, milk is the primary source of nutrition for babies. In many cultures of the world, especially the Western world, humans continue to consume dairy milk beyond infancy, using the milk of other animals (especially cattle, goats and sheep) as a drink. Plant milk, a general term for any milk-like product that is derived from a plant source, also has a long history of consumption in various countries and cultures. The most popular varieties internationally are soy milk, almond milk, rice milk and coconut milk. Tea, the second most consumed drink in the world, is produced from infusing dried leaves of the camellia sinensis shrub, in boiling water. There are many ways in which tea is prepared for consumption: lemon or milk and sugar are among the most common additives worldwide. Other additions include butter and salt in Bhutan, Nepal, and Tibet; bubble tea in Taiwan; fresh ginger in Indonesia, Malaysia and Singapore; mint in North Africa and Senegal; cardamom in Central Asia; rum to make Jagertee in Central Europe; and coffee to make yuanyang in Hong Kong. Tea is also served differently from country to country: in China and Japan tiny cups are used to serve tea; in Thailand and the United States tea is often served cold (as "iced tea") or with a lot of sweetener; Indians boil tea with milk and a blend of spices as masala chai; tea is brewed with a samovar in Iran, Kashmir, Russia and Turkey; and in the Australian Outback it is traditionally brewed in a billycan. 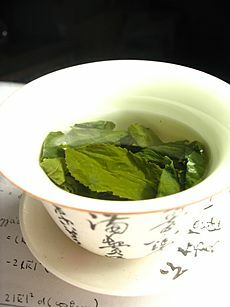 Tea leaves can be processed in different ways resulting in a drink which appears and tastes different. Chinese yellow and green tea are steamed, roasted and dried; Oolong tea is semi-fermented and appears green-black and black teas are fully fermented. Around the world, people refer to other herbal infusions as "teas"; it is also argued that these were popular long before the Camellia sinensis shrub was used for tea making. Leaves, flowers, roots or bark can be used to make a herbal infusion and can be bought fresh, dried or powdered. Coffee is a brewed drink prepared from the roasted seeds of several species of an evergreen shrub of the genus Coffea. The two most common sources of coffee beans are the highly regarded Coffea arabica, and the "robusta" form of the hardier Coffea canephora. Coffee plants are cultivated in more than 70 countries Once ripe, coffee "berries" are picked, processed, and dried to yield the seeds inside. The seeds are then roasted to varying degrees, depending on the desired flavor, before being ground and brewed to create coffee. Coffee is slightly acidic (pH 5.0–5.1) and can have a stimulating effect on humans because of its caffeine content. It is one of the most popular drinks in the world. It can be prepared and presented in a variety of ways. The effect of coffee on human health has been a subject of many studies; however, results have varied in terms of coffee's relative benefit. Coffee cultivation first took place in southern Arabia; the earliest credible evidence of coffee-drinking appears in the middle of the 15th century in the Sufi shrines of Yemen. Carbonated drinks refer to drinks which have carbon dioxide dissolved into them. This can happen naturally through fermenting and in natural water spas or artificially by the dissolution of carbon dioxide under pressure. The first commercially available artificially carbonated drink is believed to have been produced by Thomas Henry in the late 1770s. Cola, orange, various roots, ginger, and lemon/lime are commonly used to create non-alcoholic carbonated drinks; sugars and preservatives may be added later. The most consumed carbonated soft drinks are produced by three major global brands: Coca-Cola, PepsiCo and the Dr Pepper Snapple Group. Fruit juice is a natural product that contains few or no additives. 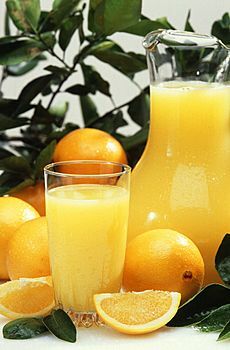 Citrus products such as orange juice and tangerine juice are familiar breakfast drinks, while grapefruit juice, pineapple, apple, grape, lime, and lemon juice are also common. Coconut water is a highly nutritious and refreshing juice. Many kinds of berries are crushed; their juices are mixed with water and sometimes sweetened. Raspberry, blackberry and currants are popular juices drinks but the percentage of water also determines their nutritive value. Grape juice allowed to ferment produces wine. Fruits are highly perishable so the ability to extract juices and store them was of significant value. Some fruits are highly acidic and mixing them with water and sugars or honey was often necessary to make them palatable. Early storage of fruit juices was labor-intensive, requiring the crushing of the fruits and the mixing of the resulting pure juices with sugars before bottling. Vegetable juices are usually served warm or cold. Different types of vegetables can be used to make vegetable juice such as carrots, tomatoes, cucumbers, celery and many more. Some vegetable juices are mixed with some fruit juice to make the vegetable juice taste better. Many popular vegetable juices, particularly ones with high tomato content, are high in sodium, and therefore consumption of them for health must be carefully considered. Some vegetable juices provide the same health benefits as whole vegetables in terms of reducing risks of cardiovascular disease and cancer. A drink is considered "alcoholic" if it contains ethanol, commonly known as alcohol (although in chemistry the definition of "alcohol" includes many other compounds). Beer has been a part of human culture for 8,000 years. In many countries, imbibing alcoholic drinks in a local bar or pub is a cultural tradition. Beer is an alcoholic drink produced by the saccharification of starch and fermentation of the resulting sugar. The starch and saccharification enzymes are often derived from malted cereal grains, most commonly malted barley and malted wheat. Most beer is also flavoured with hops, which add bitterness and act as a natural preservative, though other flavourings such as herbs or fruit may occasionally be included. The preparation of beer is called brewing. Beer is the world's most widely consumed alcoholic drink, and is the third-most popular drink overall, after water and tea. It is thought by some to be the oldest fermented drink. Some of humanity's earliest known writings refer to the production and distribution of beer: the Code of Hammurabi included laws regulating beer and beer parlours, Today, the brewing industry is a global business, consisting of several dominant multinational companies and many thousands of smaller producers ranging from brewpubs to regional breweries. Cider is a fermented alcoholic drink made from fruit juice, most commonly and traditionally apple juice, but also the juice of peaches, pears ("Perry" cider) or other fruit. Cider may be made from any variety of apple, but certain cultivars grown solely for use in cider are known as cider apples. The United Kingdom has the highest per capita consumption of cider, as well as the largest cider-producing companies in the world, As of 2006[update], the U.K. produces 600 million litres of cider each year (130 million imperial gallons). Wine is an alcoholic drink made from fermented grapes or other fruits. The natural chemical balance of grapes lets them ferment without the addition of sugars, acids, enzymes, water, or other nutrients. Yeast consumes the sugars in the grapes and converts them into alcohol and carbon dioxide. Different varieties of grapes and strains of yeasts produce different styles of wine. The well-known variations result from the very complex interactions between the biochemical development of the fruit, reactions involved in fermentation, terroir and subsequent appellation, along with human intervention in the overall process. The final product may contain tens of thousands of chemical compounds in amounts varying from a few percent to a few parts per billion. Wines made from produce besides grapes are usually named after the product from which they are produced (for example, rice wine, pomegranate wine, apple wine and elderberry wine) and are generically called fruit wine. The term "wine" can also refer to starch-fermented or fortified drinks having higher alcohol content, such as barley wine, huangjiu, or sake. Wine has a rich history dating back thousands of years, with the earliest production so far discovered having occurred c. 6000 BC in Georgia. It had reached the Balkans by c. 4500 BC and was consumed and celebrated in ancient Greece and Rome. From its earliest appearance in written records, wine has also played an important role in religion. Red wine was closely associated with blood by the ancient Egyptians, who, according to Plutarch, avoided its free consumption as late as the 7th-century BC Saite dynasty, "thinking it to be the blood of those who had once battled against the gods". The Greek cult and mysteries of Dionysus, carried on by the Romans in their Bacchanalia, were the origins of western theater. Judaism incorporates it in the Kiddush and Christianity in its Eucharist, while alcohol consumption was forbidden in Islam. The term "spirit" refers to a distilled drink that contains no added sugar and has at least 20% alcohol by volume (ABV). Popular spirits include borovička, brandy, gin, rum, slivovitz, tequila, vodka, and whisky. Brandy is a spirit created by distilling wine, whilst vodka may be distilled from any starch- or sugar-rich plant matter; most vodka today is produced from grains such as sorghum, corn, rye or wheat. 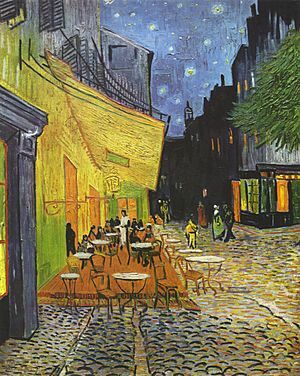 Cafe Terrace at Night, September 1888, by Vincent van Gogh. Throughout history, people have come together in establishments to socialise whilst drinking. This includes cafés and coffeehouses, focus on providing hot drinks as well as light snacks. Many coffee houses in the Middle East, and in West Asian immigrant districts in the Western world, offer shisha (nargile in Turkish and Greek), flavored tobacco smoked through a hookah. Espresso bars, such as Starbucks and Costa Coffee are a type of coffeehouse that specialize in serving espresso and espresso-based drinks. In China and Japan, the establishment would be a tea house, were people would socialise whilst drinking tea. Chinese scholars have used the teahouse for places of sharing ideas. Alcoholic drinks are served in drinking establishments, which have different cultural connotations. For example, pubs are fundamental to the culture of Britain, Ireland, Australia, Atlantic Canada, New England, Metro Detroit, South Africa and New Zealand. In many places, especially in villages, a pub can be the focal point of the community. The writings of Samuel Pepys describe the pub as the heart of England. Many pubs are controlled by breweries, so cask ale or keg beer may be a better value than wines and spirits. In contrast, types of bars range from seedy bars or nightclubs, sometimes termed "dive bars", to elegant places of entertainment for the elite. Bars provide stools or chairs that are placed at tables or counters for their patrons. The term "bar" is derived from the specialized counter on which drinks are served. Some bars have entertainment on a stage, such as a live band, comedians, go-go dancers, or strippers. Patrons may sit or stand at the bar and be served by the bartender, or they may sit at tables and be served by cocktail servers. Food and drink are often paired together to enhance the taste experience. This primarily happens with wine and a culture has grown up around the process. Weight, flavors and textures can either be contrasted or complemented. In recent years, food magazines began to suggest particular wines with recipes and restaurants would offer multi-course dinners matched with a specific wine for each course. 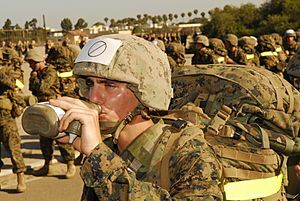 Different drinks have unique receptacles for their consumption. This is sometimes purely for presentations purposes, such as for cocktails. In other situations, the drinkware has practical application, such as coffee cups which are designed for insulation or brandy snifters which are designed to encourage evaporation but trap the aroma within the glass. Many glasses include a stem, which allows the drinker to hold the glass without affecting the temperature of the drink. 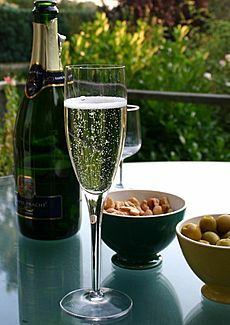 In champagne glasses, the bowl is designed to retain champagne's signature carbonation, by reducing the surface area at the opening of the bowl. Historically, champagne has been served in a champagne coupe, the shape of which allowed carbonation to dissipate even more rapidly than from a standard wine glass. Drink Facts for Kids. Kiddle Encyclopedia.